The Alhambra Fitness Court is NOW OPEN! Free world-class fitness has arrived in the Los Angeles metropolitan area! 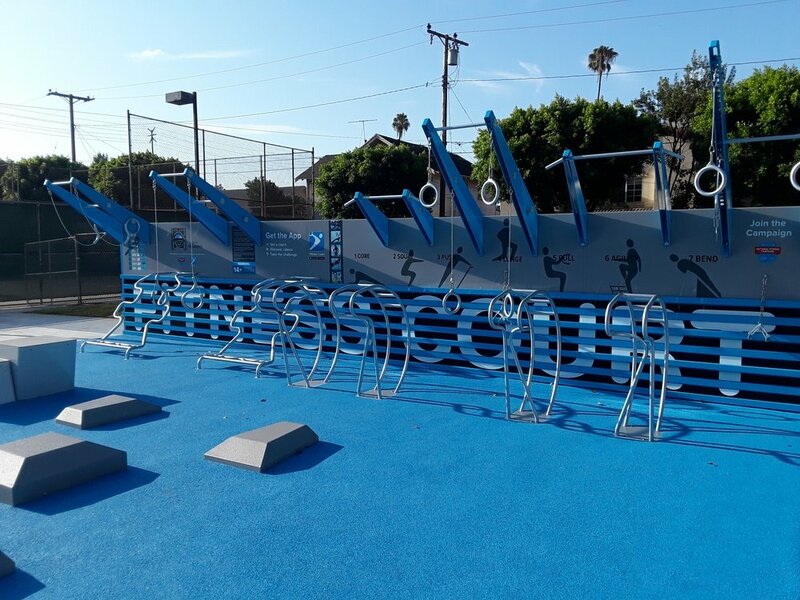 The City of Alhambra, California, has partnered with National Fitness Campaign to install a Fitness Court® — a free-to-the-public outdoor gym and community fitness hub — in Alhambra Park. Alhambra is an award-winning community, ranked among the state’s top 20 cities to raise a young family with a high quality of life. Located just minutes away from downtown Los Angeles, the Alhambra Fitness Court is a gorgeous outdoor exercise experience, made free and accessible to everyone. Alhambra Park is the city’s premier destination for outdoor activity. A fun and modern children’s play facility, water park, swimming pool, family picnic areas and acres of open green space are some of the many amenities visitors can enjoy here. Adding the Fitness Court® makes this park the ultimate one-stop-shop for recreation and wellness! The city’s Director of Community Services, Chris Paulson, saw that the progressive nature of the Fitness Court allows users to tailor workouts to meet their current fitness levels. In partnership with NFC, Chris and his team are working with local fitness groups to activate the facility and offer adaptive routines for adolescents, adults and seniors alike! THANK YOU ALHAMBRA FOR PUTTING FREE FITNESS ON THE MAP!